Beautiful doll with movable head and eyes that close in excellent condition. 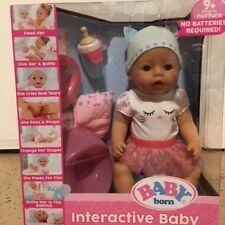 This is a New in the Box "Zapf" Miniworld Baby Born Doll with Accessories. Zapf Creation Baby Born Doll Drink & Wet Vinyl 17"
THIS IS A BABY BORN DOLL MADE BY ZAPF CREATIONS IN GOOD PLAYED WITH CONDITION. Older, 19" Zapf , Hard Vinyl & Cloth Baby Doll. Blue Sleep Eyes. Blonde Hair. Older, 19" hard vinyl and cloth baby doll. The doll has a hand-painted face, blue glass sleep eyes with long eyelashes, and a lot of light blonde rooted hair. The doll is in good condition. She is wearing a pretty pink sleeper with white dots and a lacy collar. Movable arms and legs. I THINK THE CLOTHES MAY BE ORIGINAL BUT AM NOT SURE. SHE HAS AN ORIGINAL ZAPF PIN ON HER DRESS. HER HAIR IS IN GOOD CONDITION. SHE HAS THE ZAPF "Z" INSIDE THE CIRCLE ON THE BACK OF HER NECK. ALSO LOOKS LIKE THE NUMBERS 50 ON ONE SIDE AND 17 ON THE OTHER. Zapf Puppen die mitspielen. Zapf Puppen die mitspielen g. Beautiful Max Zapf. Beautiful doll Max Zapf Creation. Fully dressed ( Original Zapf Creation Outfit ). The Max Zapf Creation. Beautiful Long shine blonde rooted hair with bangs! ZAPF 19” Baby Chou Chou weighted doll PREMMIE Outfit, Pacifier, Germany. ZAPF 19” Baby Chou Chou weighted doll PREMMIE Outfit, Pacifier, BLUE SLEEPY EYES. Germany.. Condition is Used. VERY GOOD CONDITION. WITH SOME MINOR PLAYWEAR. LOOK AT PHOTOS FOR DESCRIPTION. SMOKE PET FREE.Shipped with USPS Priority Mail. Mooshka Ballerina Casia Fairy Tales Doll Plush Ballet with bag pink gem necklace. Condition is Used. Shipped with USPS First Class Package. ZAPF Creation 19” Baby Chou Chou Working Baby Doll . Coos, baby sounds,sucking sounds when bottle is inserted,not original bottle,but works,redresses in baby gown. Body very clean. Minor play wear. Weighted to feel like baby. Smoke free. Condition is Used. Shipped with USPS Priority Mail. 19" Vintage Blonde W/ Blue Sleeping Eyes Vinyl Balica Doll by ZAPF Germany 1985. Condition is Used. Shipped with USPS Priority Mail (1 to 3 business days). Great condition. See pics. The only issue is that the elastic on her bloomers is shot. She appears to be all original, from her hair bows to her shoes. Nonsmoking home. Rooted Blonde Hair in pigtails. Beautiful Blue Sleep Eyes. LAMB TOY connects to the jumper and connects to an 8" line of wooden beads. ONESIE JUMPER has 2 buttons to connect at shoulder. Doll was 17-18" and infant shaped (a little chunky). Clothes are made from quality cotton. Zapf Creation. CHOU CHOU BABY DOLL CLOTHES. For an 18" Doll. This auction is for a Zapf Creation Little Chou Chou baby doll, with box. The baby is in great shape, has been removed from the box. The clothes have been cleaned and are in good shape. Box is in good shape with a little wear. This is a beautiful Mooshka doll from Zapf Creations. This lovely mermaid measures 14” and is decorated with pearls, sparkles and bows. She is super clean and in excellent condition! A fantastic doll for your collection! Balica doll by Zapf Creations. It is blonde haired with blue eyes that close when you lay her down. The shoes look like they may be discolored due to age. She is a very pretty doll. This is a 1988 Max ZAPT 16" doll in a Zaft Creations onesie. The doll is vinyl with a cloth body. No hair and very blue sleep eyes with lashes.The back of her neck reads,"1988 MAX ZAFT 30 W GERMANY 40 Z (in flower the ZAFT logo) 16" She is in very good condition. 12" IN LENGTH. HAVE FUN AND ENJOY! Mooshka Flowerinas Pippy Doll Fairy Ballerina Stuff Plush Zapf Creation . Condition is Used. Shipped with USPS Priority Mail. 3 ZAPF GIRL DOLL DRESSES. Baby Born Interactive Baby Doll item is a shelf pull was found in store with open box and missing pieces everthing pictured is what comes with your purchase box is not included was just pictured to show some features item has a pen dot on its hand shown in pictures needs washed off- Green Eyes. Shipped with USPS Priority Mail US shipping only no po boxes any questions will reply within 24hrs thanks! ITEM HAS BEEN TESTED AND MAKES BABY SOUNDS, HOWEVER, THE EYES AND MOUTH NO LONGER MOVE. MINOR SURFACE WEAR AND MARKS - NOT PERFECT. I AM A REASONABLE PERSON AND AM ALWAYS WILLING TO WORK WITH YOU IF THERE ARE ANY ISSUES. Lot: Authentic Chou Chou Baby Doll Dress 19" Doll & Other Clothes For 18-22"
Lot Of Doll Clothes For 18 To 22" Dolls. Includes an authentic Chou Chou baby doll dress for 19" Doll. This is a plush/fuzzy hooded blanket, sewed up the sides, and all lined in a goldenrod soft material. On the front is "Bee. Bee." and flowers. Her head is vinyl and limbs are part vinyl and part cloth with a cloth stuffed “beanie” torso. She is very clean and is just the right size for little mommies to grasp and carry around. Her original teddy bear is originally tied with a pink ribbon to her wrist (see picture). Printed "made in Western Germany" on bottom of shoe. dress is made of felt and full of holes. Clean good condition. arms and neck move/turn. Mooshka Tots Sonia Doll Plush Zapf Creation. Condition is Used. Shipped with USPS Priority Mail. Vinyl head, lower arms/hands, lower legs/feet. Brown sleep eyes that have all their lashes. Item # 4P-30. GREAT SHAPE! "Zapf Creation Doll " She is wearing a blue jeans overalls / BIBS with a patch of a frog on the front and a Zapf Creation sewn on plastic pin with her white socks and black patent shoes. You are buying a really adorable vinyl & filled fabric baby maker marked Zapf doll. #5018She is very cute! She is approx. She appears to be in very good overall condition.She has painted facial features with no real show of wear. Chou Chou 18" Baby Doll. PACIFIER with BEAR CLIP. Zapf creation baby doll. Gently used. Comes from animal friendly, smoke free home. 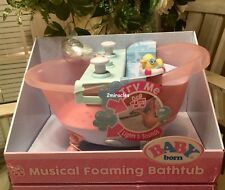 New magical and musical foaming play bathtub. ZAPF - VIVIAN BY CATHARINA TEUNISSEN. Vivian is a lovely creation by doll artist Catharina Teunissen. FROM: ZAPF. SERIES: ZAPF CREATION. INCLUDES: DOLL, TOILET, OUTFIT, HAT. Doing that is against U.S. and international laws. Here’s the Zapf Creations Mini World Baby Born Doll. Adorable jointed doll, very detailed despite its small size. There are tiny gray spots on the back of her head, but plenty of use left. Perfect accessory to hold all your baby dolls needs! New ListingZAPF CREATIONS BABY BOLL 19"
Sweet baby by Zapf. The only thing i see wrong with her is she could use a bath. 1986 Vintage Max Zapf 20" Doll W-Germany 50/18 Brown Eyes and Light Brown Hair. Condition is Used. Shipped with USPS Priority Mail Large Flat Rate Box. Made in West Germany. This doll is used but in great shape. Baby Born Mini World set with Duck riding toy / stroller. The duck has a detachable handle for pushing. No smoking no pet household. NEW VINTAGE GERMAN TOYS & CRAFTS 1980s ZAPF DOLL BROWN DRESS, HAT, & BOOTS 20"